It seems like an idea of getting back to traditional food is so natural and effortless. In fact, it is nothing but radical. You have to think differently, you have to shop your groceries differently, you have to cook differently, and you have to get used to different forms and shapes food comes to your table. Let your taste buds be your guidance! When I’ve nurtured my first crop of heirloom tomatoes, I was very confused, to say the least. They looked nothing but what I’ve used to shop in a grocery store – they were all different shapes and, which was the most frustrating, with ugly green shoulders. I’ve searched the internet and figured out that I did nothing wrong, that heirloom tomatoes, just like wild ones, were meant to be this way. I felt somewhat disappointed, but, gradually, the unusually rich and savoury sweet mouth watering taste of a fresh, sun ripen, home grown tomato made me forget about all the grocery store aesthetics. 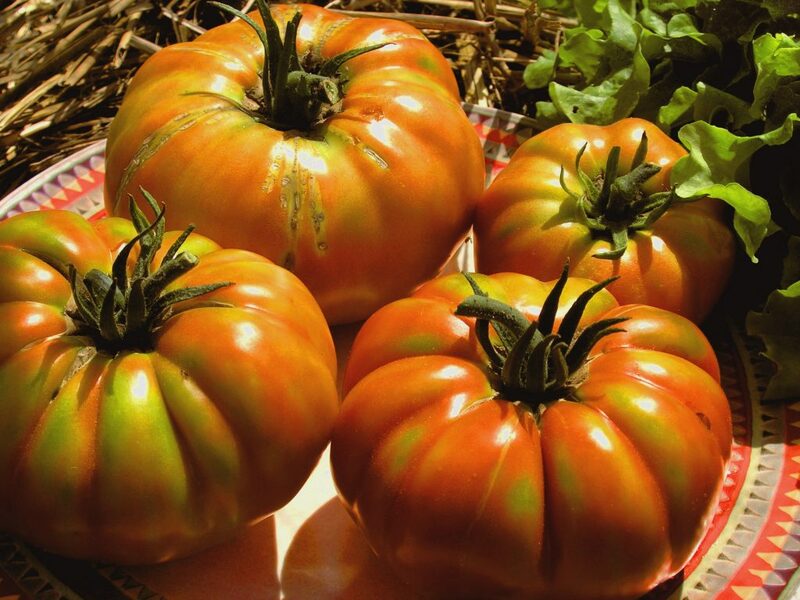 Uniform colored varieties, which are grown commercially worldwide today, has been selected not that long ago to please picky supermarket consumers, who might find the heirloom ones less appealing or unripe. The problem is that in a process of selecting some good genes that control flavour were deactivated, resulting in almost tasteless produce. Living in the northern climate, we have about 2 months of luxury of enjoying our heirloom tomatoes with green and yellow shoulders. The other 10 months we are craving them. Once in a while we buy a few pieces in a grocery store, just to get disappointed once again by their flat taste and uniformly boring look.